Before describing the details of networking, here’s an overview of how signs can be connected or networked to a PC. 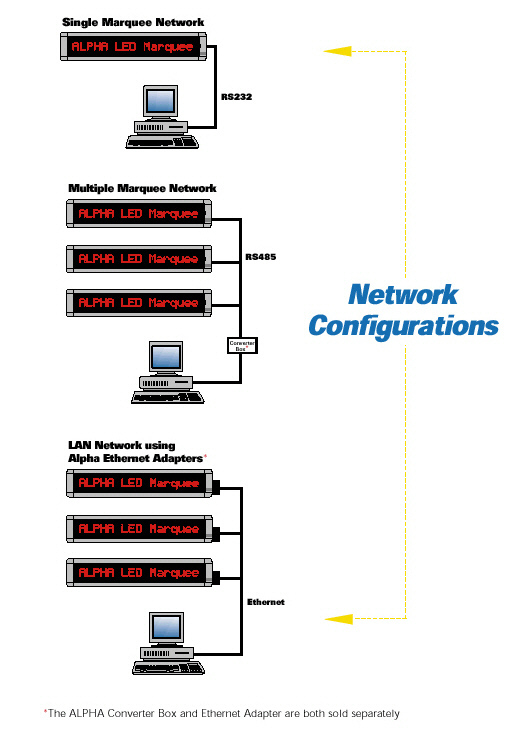 Keep in mind that a network could be made up of a combination of the following configurations. For example, a group of signs could be in a Cable network that is connected to a PC via a Modem network. Messages are entered through a remote control keyboard or from a PC with optional AlphaNET or ActiveX Software. All signs can be networked and connected to a computer via RS232, RS485 or optional Ethernet to form an effective integrated visual information system. A 10-ft. RS232 Interconnect Cable(A9)and RS232/RS485 Converter Box III with AC adapter makes communication possible between a PC and wired network of LED signs. The Converter Box converts standard RS232 from a PC serial port into RS485 signals for use in networks of signs. Use this setup when multiple signs need to be connected to a serial RS485 network. This network requires the installation of RS485 wiring, a 22 AWG shielded single twisted pair with drain wire. Up to 255 signs can be connected and individually addressed in this type of network using AlphaNET Software, ActiveX or Custom Protocol Routines. 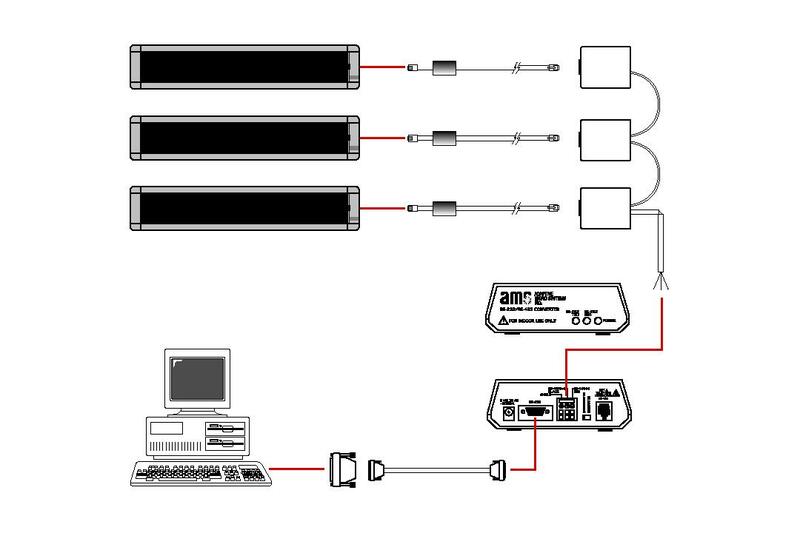 Each LED Sign requires a Modular Network Adapter with 1-ft. or 8-ft. RS485 data cable (RJ11). RS485 Serial data cable (22AWG shielded, single twisted-pair, with drain wire)connects the units up to 8,000 ft.